Many people in the village cook their food using firewood got from Karura forest which is just stones throw away. This is normally preferred because it does not cost too much cash or at times nothing at all. On the other hand it is a disadvatage to use firewood because it gives out smoke which brings soot strands inside the house, thus making it ugly and also causing some diseases, e.g. asthma. To us usage of firewood is somehow a threat. 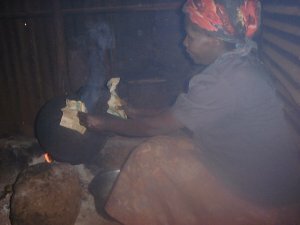 The other way in which people cook is by using paraffin or charcoal stoves. The latter is affordable since charcol is prepared using logs from the forest. Something to be noted is that charcoal burning is done by some people then selling to others. This charcoal burning should be discouraged in the village since recently it has caused bad reports e.g. setting houses aflame and its smoke causes fatal diseases.